Vincent Valdez with Till Then (detail), 2016. Photograph by Ricardo Romo, courtesy David Shelton Gallery. 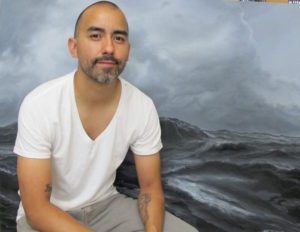 Valdez’s work is included in numerous museum collections and has been exhibited nationally and internationally, including at the Los Angeles County Museum of Art; The Blanton Museum of Art; The Museum of Fine Arts, Houston; Snite Museum of Art at the University of Notre Dame; Parsons School of Design Museum, Paris; Fundación OSDE, Buenos Aires; among others. His work will also be featured in the exhibition Suffering From Realness at MASS MoCA in spring 2019.